Quarries are sites where rocks or stones are produced. It is well-known that stone was widely used to make implements with edges and points during the so-called Stone Age. This era corresponded with a new chapter in technological prehistory. The Quarry is one of the very first buildings in the game. The Quarry produces Stones overtime. The Quarry is one of the four resource production buildings in Rise of Kingdoms beside Farm (for food), Goldmine (for gold) and Lumber Mill (for wood). 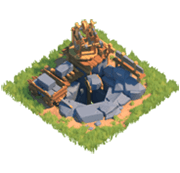 By upgrading the Quarry, you increase its production speed and the maximum Stone capacity. Players can get the lots of rewards by upgrading the Quarry.